The Wolf-2 (Volk-2) mobile robotic system. New robots under development for Russia's Strategic Missile Forces are to be entrusted with guarding missile complexes. In the future the robots will even be able to launch ballistic missiles, but meanwhile developers are continuing their scientific research and establishing requirements for the potential robotic "guards" of Russia's nuclear arsenal. Combat robots being developed in Russia will soon be able to guard complexes containing ballistic missiles such as the Topol-M and the Yars, which are part of Russia's Strategic Missile Forces (RVSN). On Dec. 17 RVSN Commander Sergei Karakayev told journalists that the robotic systems in these kind of forces will be able to provide solutions for various challenges: from doing all types of reconnaissance work in the deployment zones of missile divisions to helping the personnel. Also, Karakayev does not rule out that the Yars and Topol "guards" will be developed as part of the work already carried out on the establishment of potential missile systems. In essence, this is turnkey work, in which a personal "guard" will be appointed to the new system being created – one capable of launching ballistic missiles. 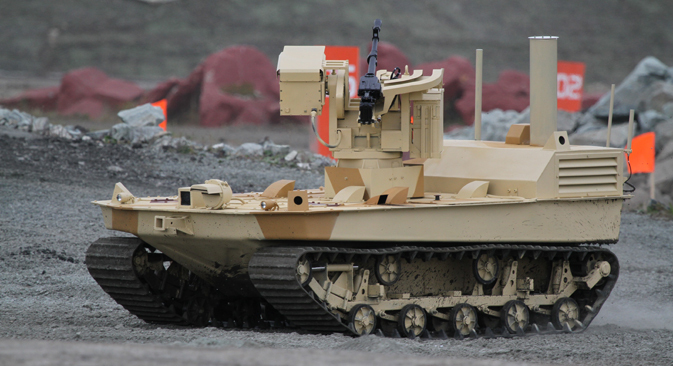 Development and testing is known to be continuing on the Wolf-2 mobile robotic system for service in the RVSN. Mounted on a crawler, this robot is a real universal soldier, powerful and heavy, capable of carrying out practically any combat mission: from patrolling the programmed territory and conducting reconnaissance assignments to guarding important objects and supporting the tactical group with fire. The Wolf's "teeth" are the Kalashnikov heavy machine-gun and the Utes and Kord large-caliber machine-guns. The robot's main advantage is its capability to keeping firing as it is moving (at a speed of over 20 mph) with limited visibility, including at night. A thermal imager, a laser rangefinder and a gyrostabilizer help the Wolf fire with precision. Sergei Karakaev also did not exclude the use of combat robots that already serve in other kinds of forces. Currently, the Russian land forces actively use the Platform-M robot, which is smaller than the Wolf-2, but carries out the same functions. The system is armed with grenades and the Malysh machine-gun, and is capable of engaging in contactless combat. Karakayev underlined that in the near future the new fourth- and fifth-generation control systems, besides guarding ballistic missiles and helping RVSN servicemen, may be charged with "delivering orders from the command directly to the launchers, thus bypassing intermediate links, including in conditions of nuclear activity and electronic warfare." This means that in the event of a direct threat (for example, when the early missile warning system registers an enemy missile launch or when the catastrophe has already occurred), the robots will decide to make the retaliatory attack by themselves. For now Russian robotics (both military and dual-purpose) is not in a condition to entrust the robots with such an important mission, and most existing systems are remotely controlled. Therefore, according to Karakayev, "before new robotic systems are accepted into the armed forces it will be necessary to carry out further research and tests." Such tests are already taking place within the framework of a special program geared toward developing military robotics, which is designed to supply the armed forces with new combat robots by 2025. In September 2015 the Russian Military Industrial Committee (MIC), in collaboration with the Defense Ministry, developed a range of tactical exercises for testing the robotic systems being accepted into the armed forces. Shortly afterward, in October, representatives of the Russian United Instrument Manufacturing Corporation announced the completion of an automated control system for groups of robotic resources named Unicum. This system, according to its developers, provides for a full exclusion of the human being from the control process while giving the mechanism almost human possibilities.